Discussion on defining district borders for Montreal is in progress. If you know the city pretty well, please share your opinion on the talk page. Montreal is a huge city with several district articles containing sightseeing, restaurant, nightlife and accommodation listings — have a look at each of them. Montreal  (French: Montréal) is the metropolis of the province of Quebec. Quebec City is the political capital but Montreal is the cultural and economic capital of Quebec and the main entry point to the province. The second largest city in Canada, it is a city rich in culture and history and a well-deserved reputation as one of the liveliest cities in North America. Montreal is the second-largest French-speaking (as a mother language) city in the world, behind Paris. The population of Montreal is about 1.9 million, with 4 million in the metro area. Montreal is sometimes referred to as The Paris of Canada. Downtown — Skyscrapers, shopping, museums, Concordia universities, and the Parc du Mont-Royal. Old Montreal — The historic and (dare we say it) quaint riverfront Old Town and Old Port. Chinatown — The third largest in Canada, filled with numerous restaurants and shops. Quartier Latin-Le Village — Restaurants, boutiques, cafes, pubs near UQAM in the Quartier Latin, gay bars and clubs in Le Village, and the working class neighbourhood of Sainte-Marie. Parc Jean-Drapeau — The islands of Île Sainte-Helene and Île Notre-Dame and the Montreal Casino. The Plateau — A large, trendy district north of downtown and east of Parc du Mont-Royal noted for its quaint architecture, diverse mixture of cultures and languages, parks, music venues, theaters, restaurants, pedestrian streets, and the location of many summer festivals. Its attractions include Parc Lafontaine, the Main (Saint Laurent Blvd) with its many hotspots, St-Denis and Mont-Royal for shopping, eating and drinking. The Plateau includes several distinct neighbourhoods, including Mile End. Mile End — The legendary Fairmount and St. Viateur bagel shops, Dieu du Ciel brewery, trendy restaurants and cafés, bookstores, thrift shops, espresso and soccer bars, the Rialto Theatre, St Michael and St. Andrew's church, boutiques and hipsters. Rosemont–La Petite-Patrie — Little Italy and Rosemont, home to Italian, Vietnamese, and Latino communities, as well as the Jean-Talon market, one of Montreal's largest, most popular, and liveliest open-air markets. The section of St-Laurent Boulevard that runs through this borough has seen a recent (2015) resurgence in new restaurants and bars. Westmount–Notre-Dame-de-Grâce — Westmount is legally a separate town from Montreal and is mostly residential, although it has a lively section of Sherbrooke Street and Victoria Avenue as its commercial hub. Greene Avenue further east is another tony commercial area. Notre-Dame-de-Grâce (NDG) is a diverse neighbourhood that includes leafy residential streets, a long commercial section of Sherbrooke West, gentrified Monkland Avenue, the Saint-Jacques strip, and the new MUHC hospital at Vendôme metro station. Hochelaga-Maisonneuve — the "Espace pour la Vie" includes the Olympic Park, Botanical Gardens, Biodome and the Planetarium. The area has many parks with play area for children and a lot of sports facilities. Examples are Parc Luis Riel where there are tennis courts, two baseball pitches, three grass soccer fields and one artificial one. Parc Piérre Bédard has an archery field. Parc Maisonneuve is excellent for joggers and bikers. It offers a closed track to both. There are public swimming pools free for all. Côte-des-Neiges — Multicultural neighbourhood northwest of the mountain. NDG and Côte-des-Neiges are part of one large borough but have quite different vibes. Côte-des-Neiges is a vibrant street that borders on the academic world of the Université de Montréal and the Hautes Études Commerciales on one side, and the hospitals (St. Mary's and the Jewish General) on the other. Queen Mary Road is another commercial street of note. Outremont — Upscale, francophone neighbourhood noted for its architecture, boutiques and restaurants, and its flourishing Hasidic community. South West — Including the Lachine canal, Atwater Market, St. Henri, and the emerging culinary hot-spot, Little Burgundy. Villeray/Parc-Extension – Parc Extension, one of Canada's most ethnically diverse neighbourhoods, is noted for its vibrant South Asian community and its family-run restaurants, while to the east, beyond Jarry Park and north of Little Italy, lies Villeray, mostly residential, but also home to a range of cafes and restaurants. Ville Saint-Laurent — The largest of Montreal's boroughs, it offers a mix of residential and industrial areas. Terminus Côte-Vertu provides multiple bus routes that reach the West Island and Laval. Situated on an island in the St. Lawrence River at the historically highest navigable point, Montreal has been a strategic location since before the arrival of Europeans in Canada. A thriving St.Lawrence Iroquoian town called Hochelaga was on the site of present-day Montreal when explorer Jacques Cartier first visited in 1535. A hundred years later, in 1642, the tiny town of Ville-Marie was founded as a Sulpician mission by Paul Chomedey, sieur de Maisonneuve. It soon became a centre of the fur trade. After its capture by the English in 1762, Montreal remained (until the 1970s) the most important city in Canada and was briefly capital of the province in the 1840s. Prohibition on sales of alcohol in the United States during the 1920s and 1930s made Montreal a mecca for cross-border fun seekers from nearby New England and New York. The city built up a seedy, yet playful, industry in alcohol, burlesque and vice. In the 1960s, an urban renewal drive centred around Expo 67. The World's Fair in Montreal brought a subway system and a number of attractive urban parks and is considered to be one of the most successful World Fairs. Over 50 million visitors gathered to Montreal during this memorable summer. The 1976 Olympics left a strikingly idiosyncratic stadium and many other urban improvements. The opening of the Saint Lawrence Seaway in 1959, though much lauded as an economic boom, spelled the beginning of the end for Montreal's economic dominance in Canada. Once the transition point between western railroads and eastern sea carriers, Montreal watched helplessly as some of this business moved farther west, up the now navigable Seaway, to ports in Ontario and on Lake Superior. The Quebec Sovereignty movement, which began to pick up steam in the 1960s, further chilled the atmosphere for Canada-wide businesses, many of which moved their headquarters to Toronto. Following an economic depression in the 1980s and 1990s, Montreal became more secure in its place in North America and the world. It remains a centre of culture, arts, computer technology, aerospace, the biotech industry, and media for all of Canada. Montrealers use an unconventional compass, using the river and the mountain as cardinal points. 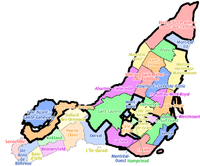 When you are downtown, the St Lawrence River is “south” and Mount Royal is “north”; making the West Island and the East End correct in both their names and orientations. The dividing line between "east" and "west" downtown is the boulevard Saint-Laurent. In downtown, streets slope up "north" toward Mount Royal. This local compass tends to confuse visitors because the “East” End is really to the north and the “West” Island is to the south, and the St Lawrence River runs almost northeast-southwest at this location. Montreal itself is a very safe, open, and inviting city. The métro station in the Gay Village, Beaudry, is marked with rainbow pillars. Montreal's pride celebration, Divers/Cité(last week of July, first week of August) is the second-largest in Canada after Toronto's. The climate of Montreal is a true humid continental climate with 4 distinct seasons. The city has warm, to very hot & humid summers, generally mild spring and autumn, and often very cold & snowy winters. Montreal gets over 2,000 hours of sunshine annually. Precipitation is moderate throughout the year, with around 2 meters of snow per season. 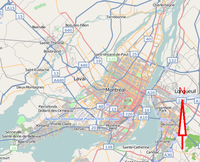 Montreal's Pierre Elliott Trudeau Airport  (IATA: YUL) (formerly Dorval Airport) is about 20 km west of the city centre on Expressway (Autoroute) 20. Note that travel time to the airport from the city centre can be as much as an hour, depending on traffic. The airport is served by all major Canadian and U.S. airlines and is a major hub for Air Canada  and Air Transat . International flights are serviced by Air Canada, WestJet, Aeromexico, Cubana, Copa, Air France, British Airways, KLM, Lufthansa, Icelandair, WOW Air, Swiss International Air Lines, Turkish Airlines, Royal Air Maroc, Air Algérie, Royal Jordanian, Qatar Airways, and Air China to name a few. The taxi fare to and from downtown is a fixed price of $40 and not less than $17 to other destinations (a sticker on the window behind the driver gives the boundaries of the zone where the flat fare applies; if you are going from or to places outside this zone, you will have to pay a metered fare with a minimum of $17 when leaving from the airport). If you wish to pay by credit card, let the driver (not the dispatcher) know before you get into the taxi, as it is not unknown for drivers to insist on cash upon arrival. In addition, it is wise to confirm that your destination is within the boundary of the flat fare. STM Airport Express bus 747  offers service between the airport and downtown Montreal 24 hours a day. A single fare will cost $10 (exact change in coins only when paid in the bus) and includes unlimited use of the STM bus and metro network for the following 24 hours. There is also a ticket machine in the airport where you can purchase fares. You also have the choice of purchasing a three-day pass for $18 or a weekend pass (valid from 6PM Friday until 5AM Monday) for $13 that also include the price of your 747 fare. The bus will stop at Lionel-Groulx metro station and a number of downtown stops. Free Wi-Fi service is available on most 747 buses. It is an approximately 20 minute ride to the first Métro station, Lionel-Groulx on the Orange and Green Lines, which provides easy access to many parts of downtown and other popular destinations. The bus terminates at the Gare Autocars (intercity bus station) where you can transfer to local buses, Greyhound, Orléans Express, and the Métro (Orange, Green, and Yellow lines via the Berri-UQAM station). Between 5:00 AM and 1:00 AM, take bus 204 east (est) or bus 209 (STM ) which leaves from outside arrivals every 15-30 min to Gare Dorval (Dorval Train Station). Check that the driver is not going west (ouest) as both ways are served from almost the same place, and the sign does not say. Also, be sure to keep the ticket that the driver will give you as it is a transfer which you will need later. From Gare Dorval, use your transfer ticket to catch any one of buses 211, 411, 405, 425, or 485 to Lionel-Groulx metro station. Also make sure it is going east as the same routes go west too. Your transfer will then let you into the metro. This costs only $3, but exact change in coins only must be provided to the first driver. Take the Montmorency-bound orange line or the Honoré-Beaugrand-bound green line into downtown on the metro. Between 1:00 AM and 5:00 AM, for the same price ($3, exact change in coins only), take bus 356 (again, check that the driver is going east, not west) directly into downtown via Sherbrooke. This bus runs relatively close to most downtown hotels. However, if needed, a transfer can be completed to access the rest of the city. See the STM's trip planner or Google Maps for more details. Plattsburgh International Airport and Burlington International Airport, both located in the US, are each about two hours' ride from Montreal. Adirondack Trailways offers a bus service between Plattsburgh International Airport and Montreal. Greyhound offers a bus service from Burlington International Airport and Montreal. For travellers from the US, these airports may offer a significant cost savings compared to Trudeau but at the added inconvenience of arranging ground transportation between the US and Canada. If you consider the snow, the potholes, the dense downtown traffic, the few and expensive parking places and all the signs in French, driving in this huge city can be a true dare if you are not prepared. Downtown, several streets are one way, making somehow intricate turning at an intersection. The autoroutes (those are expressways or freeways) are quite difficult if you are a tourist because most signs are written in French- although the symbols are quite the same as in English Canada and the United States. Be watchful of the lack of relation between the street names and the real cardinal points: the "east", "west", "north", and "south" of the street names are actually northeast, southwest, northwest and, southeast respectively, so the navigation system won’t be very helpful if you are not aware of this. The cheapest way to go between cities in the area is often by rideshare. Many rideshares are offered by people who are making the trip anyway and have extra space in their car, or by those who operate informal businesses driving passengers. Rides are frequently offered to and from Ottawa, Toronto, Kingston, New York City, and many other smaller or further destinations. Rides can be found on unregulated websites like Craigslist  or Kijiji , via public Facebook groups, or by semi-regulated, fee-based companies like Poparide  Kangaride/Amigo Express . Ridesharing is a relatively safe and popular way of travel with students, travellers, and young people, but the inherent risks of travelling with strangers should always be weighed, particularly when using unregulated platforms to connect with a driver. From New York City, take Interstate Highway 87 north through Albany and the eastern half of New York State for about six hours. After the border crossing near Plattsburgh, the freeway becomes Autoroute 15, which leads directly into downtown Montreal over the Pont Champlain, the most beautiful approach to the city. The drive time from Plattsburgh to downtown Montreal is approximately one hour. From Syracuse and further west, take Interstate Highway 81 north through Watertown across the Thousand Islands Bridge in Canada, then merge onto Highway 401 east to Montreal. From Boston, take Interstate Highway 93 to Highway 89 after you cross into New Hampshire. Follow Interstated 89 north to and through Vermont to the border crossing, where it turns into Highway 133. This secondary road continues to Autoroute 10, which leads directly into downtown Montreal. The whole trip takes about 5 hours. Once you cross the border it is about an hour to Montreal. VIA Rail Canada  operates fast and comfortable passenger trains from Montreal along the busy Quebec-Ontario corridor and to destinations in northern Quebec, New Brunswick, and Nova Scotia. All fares below are five-day advance booking prices for one-way travel in "Comfort" (coach / economy) class, expect to pay almost 50% more if you book on the day of travel. Check the VIA website for "express deals" , which are posted every Thursday. Highly discounted tickets are available, typically for long distance train routes or short distance trips at non-peak hours. Express deals on short distance trips (e.g. Montreal-Toronto) are typically offered only for the upcoming weeks, whereas long distance deals (e.g. Montreal to Winnipeg) may be available several weeks in advance. "VIA-1" (first / business) class is available for a premium and includes a meal, alcoholic refreshments, snacks, and free wireless internet in both station lounges and on board the train. VIA Rail offers free travel to infants (under 2 years) not occupying a seat and discounted travel for children (under 11), youth (12-25 years old or anyone with an ISIC card), and seniors (60 and over). Bicycles can also be brought aboard as is on certain Corridor trains during the summer months. See Rail travel in Canada for more information. Seven trains a day operate to and from Ottawa (two hours, from $35). Ten trains a day operate to and from Toronto (four and a half hours, from $85). Amtrak's  'Adirondack' service to New York (11 hours, from $65 US) departs daily, with connections in Schenectady to (but not from) Chicago (24 h, $114 US) and in New York to Philadelphia (14 h, $97 US) and Washington, DC (16 h, $120 US). The train also passes through much of upstate New York and hugs Lake Champlain for a large part of the trip. South of Albany, the route follows the Hudson River and passes a number of historic sites. Reliability of the service has improved greatly since an extra hour was added to the previous 10 h schedule, but one should still factor in the frequent possibility of arriving an hour later than scheduled. Train passengers leaving from Boston may take the Northeast Regional or Acela Express to Penn Station, New York, and transfer to the Adirondack line to Montreal, but this method requires significant layover times in New York. There are extensive services to Montreal from cities in Ontario, Quebec, New York, Vermont, and Maine. Buses arrive and depart from the Station Centrale d'autobus (not to be confused with the Gare Centrale or central train station) at 505 boulevard de Maisonneuve est, (directly above the Berri-UQAM metro station]. Call 514-842-2281 for schedules and prices. Intercity bus services to Montreal are offered by Megabus , Coach Canada , Adirondack Trailways , Greyhound Canada , Greyhound Lines , Voyageur , and Orléans Express . Orléans Express is the principal bus carrier in the St. Lawrence Valley, including the Montreal—Quebec City route (discount student tickets are offered). Connections to the Canadian Maritimes (New Brunswick, Prince Edward Island, and Nova Scotia) are available through Maritime Bus , which terminates service in Riviere de Loup, where it connects to Orleans Express. Voyageur, a subsidiary of Greyhound Canada, provides service to Ottawa, connecting with other bus routes to points in western Canada. Coach Canada provides service to Toronto, connecting with other bus routes to western New York, southern Ontario, Michigan and Illinois. Other regions of Quebec are served by various companies. Greyhound Lines offers three daily direct services and Adirondack Trailways offers two daily direct services, from New York, with additional trips operated on weekends and in summer (8 h, from $76.50 US). Vermont Transit, a subsidiary of Greyhound Lines, offers four daily direct services from Boston, though Vermont Transit is now operating under the name of Greyhound Lines (seven hours, from $72 US). Note that there is no student discount on the Montreal-New York service. The train is slower but significantly cheaper; around $62 CA compared to about $75 CA for the bus. However, for about $15 CA extra, the bus makes for a much quicker journey with a much quicker passage through customs; so for speed, the bus is far superior; but for comfort and scenery, the longer train journey is more pleasantly spent. The Port of Montreal includes the Iberville cruise terminal on the Alexandra Pier in the Old Port (Vieux-Port). Each year, about 50,000 passengers pass through Iberville terminal, which is an easy walk to and from the historic district of Old Montreal. If you want to bike around, bicycles can be rented from Montreal on Wheels, located just five minutes' walk from the terminal. Alternatively, you can take one of the taxis lined up at the dock. Major companies include Taxi Diamond and Taxi Coop. The airport  is on the western part of the island. From the main terminal, exit onto the main access road and turn right. Wind along the access road until the first major interchange and turn right. You will reach Albert de Niverville Boulevard and be forced to turn left (south) towards the main highway (Autoroute 20). At the end of this Boulevard, turn right on Cardinal Avenue. To your right, you will come to a pedestrian underpass that takes you under the railway tracks and leads to the Dorval Circle, a very busy traffic circle. This looks intimidating, but the traffic lights will allow you to ride safely under Autoroute 20 to Dorval Boulevard (Boulevard Dorval). Continue south down Dorval Boulevard until the end. Turn left on Lakeshore Drive (Chemin Lakeshore) towards the city. This road turns into Boulevard St. Joseph. You will eventually come to a bike path to your right that winds along the shores of Lac-Saint Louis (part of the Saint Lawrence river) through the town of Lachine. Continue down this path until you reach the entrance of the Lachine Canal. Cross the canal and continue down the Lachine Canal Bike Path (Piste Cyclable Canal Lachine) and follow the signs to the Old Port (Vieux Port) in Old Montreal (Vieux Montreal). The Lachine Canal Bike Path can be quite busy on weekends and holidays, so be ready to take your time. It is paved over its entire length. Cyclists approaching Montreal from the west should take secondary highways to Dorion, where Autoroute 20, inaccessible to bicycles over most of of its length, becomes accessible as it crosses bridges first to Île Perrot (Perrot Island) and then to the Island of Montreal (at Saine-Anne-de-Bellevue). Bicycles should use the sidewalk on these bridges as traffic is usually heavy. From here, cyclists may take Lakeshore Boulevard and the Lachine Canal Bike Path (see Airport section above) to Old Montreal and the downtown core. Cyclists approaching Montreal from the South Shore to the south and east of Montreal may access the Island of Montreal a number of ways prior to the first significant snowfall (real-time updates: ). The surest way is using the multipurpose path of the Jacques Cartier Bridge. A paved bike path along the shores of the Saint Lawrence River provides the most scenic approach to the bridge. An equally popular route is from the Saint Lambert Locks (Ecluses Saint-Lambert) of the Saint Lawrence Seaway near the Victoria Bridge (Pont Victoria) east of Montreal. The bike drawbridge may be blocked by the entertaining spectacle of a ship passing through the seaway. From here, cyclists take the Grand Prix racing track (Gilles-Villeneuve circuit) on Île Notre Dame to the Concord Bridge to Montreal. This route is closed sometimes for car racing events . In this case, cyclists can take a circuitous detour down a gravel causeway dividing the seaway and river to the Estacade, an ice boom that crosses the river parallel to the Champlain Bridge to Nun's Island and eventually Montreal. A lesser known crossing involves one at the Sainte Catherine Locks (Ecluses Sainte-Catherine) at Saint Catherine south of Montreal. These bridges cross the seaway to the same causeway as the Saint Lambert locks. In this case, the road to the Estacade ice boom is paved. These bike links from the South Shore are open from 15 April to 15 November, from 6:30AM to 10:00PM. . The Champlain Bridge, Mercier bridge, and Lafontaine Tunnel are definitely inaccessible to bicycles. These can be dangerous, even in a car. A bicycle path crossing the Mercier Bridge was expected to open in 2012 but has only been built halfway across the river, due to funding cuts by the the provincial government. Thus, the Mercier remains inaccessible to bicycles or pedestrians. Montreal has historically been divided into east and west by boulevard Saint-Laurent. Numbered addresses on streets that cross Saint-Laurent start there and increase in either direction; most addresses are given as "rue ____ Ouest" (west) or "rue ____ Est" (east). Many streets are named after Catholic saints and figures from local history, both well-known and obscure. Note that in Montreal street names, "east" and "west" refer to the direction parallel to the St. Lawrence River, and "north" and "south" refer to the direction perpendicular to the St. Lawrence River. Because the St. Lawrence River runs almost north-south near downtown Montreal, "east", "west", "north", and "south" are actually northeast, southwest, northwest and southeast respectively. Confusingly, most maps displayed in the city have "Montreal north" on top which can be confusing with a satellite navigation that uses pole north. Also, don't try to navigate by looking at the sun! Walking is a favoured way to get around the densely packed downtown and the narrow streets of Old Montreal, especially during the warmer months. However, beware during winter months, as sidewalks can be icy and extremely hazardous after winter snow and ice storms. Winter boots with good grip are essential for surviving pavements that have not been cleared. Beware also (as much as you can) of thawing ice falling from overhanging balconies and roofs. But you can always take the stairs down to Montreal's famous "Underground City" (Montréal souterrain), called RÉSO , a network of pedestrian corridors connecting Métro (subway) stations, shopping centres, and office complexes. Jaywalking is widespread and rarely punished (although Montreal police now hands out jaywalking tickets more frequently). However, be aware that drivers are used to jaywalkers timing their crossing with their passing and will most likely go on when a pedestrian steps in the street, braking or slowing down only if they feel a collision likely. At an intersection, however, a pedestrian will have right of passage before turning traffic, but some drivers do not respect this. Montreal drivers rightly have a poor reputation for aggressiveness and they generally do not respect pedestrians. Always watch out for drivers and cyclists before crossing. Rue Prince-Arthur, east of Saint-Laurent, is for pedestrians only. Another pedestrian-only locale is Montreal's Chinatown, situated on Rue de la Gauchtière Ouest between Saint-Urbain and Saint-Laurent. A good trick for navigating downtown Montreal is to remember that streets slope up toward Mount Royal, which is just north of downtown and easy to see from most locations. The districts surrounding downtown Montreal are especially delightful on foot. To the south is Old Montreal (Le Vieux-Montréal)  (its narrow streets and buildings dating from the 17th and 18th centuries really can make you feel like you're in Old Europe) and the Old Port (Le Vieux-Port) , a waterfront strolling park with exhibits and boat tours, is very popular with the locals. To the north, the Golden Square Mile and the McGill University Campus is wedged between Mount Royal and Sherbrooke Street on the southern slope of the mountain. Old Victorian mansions and townhouses can be found along the sloping streets, many now housing McGill University's offices and libraries. Just west of downtown is affluent Westmount, a perfect example of 19th-century English-style homes and gardens (inhabited to a great extent by English-speaking people) climbing the slopes of Mount Royal's western part (the higher you climb, the larger the old mansions). Just east and northeast of downtown are the mostly French-speaking Gay Village (Le Village Gai) and Plateau (Plateau Mont-Royal) districts. Street after street displays turn-of-the-19th-century row duplexes and triplexes, replete with famous Montreal outdoor staircases, overflowing front gardens (or snow-covered gables, depending on the time of year), and tiny shops tucked into every nook and cranny. For people who like to see a culture where it lives, Le Plateau is the place to wander about in. Mount Royal (Mont-Royal) is also accessible from the urban core on foot. . Fit pedestrians can climb Rue Peel to the southern edge of the park. A series of renovated staircases will take you directly to the Chalet near the top of the mountain, with its classic view of the downtown core. A more leisurely climb to the top awaits those on Olmsted Road (6.5 km), a wide, gently sloping bike and foot path accessible from the Plateau in Parc Jeanne-Mance (also known as Fletcher's Field). Smaller foot paths serendipitously branch off from this road. A cross-country ski path also winds to the top in the wintertime. Mount Royal's park was designed by Frederick Olmsted, a landscape architect who lived from 1822 to 1903 and was also responsible for the design of Central Park in New York City  and the Emerald Necklace in Boston. It is easy to hail a taxi on most busy streets. Taxi drivers are generally friendly, although in typical Montreal fashion, they tend to drive aggressively. Although all taxi drivers are able to understand street addresses in English, it is important to bear in mind that some Montreal taxi drivers have a very limited knowledge of English. In Canada, as in the United States, it is customary to tip a taxi driver approximately 15% or slightly higher. In general, Montreal taxi drivers only accept cash except at the airport and when using Uber. Get cash before hailing a taxi cab or ask the driver if he or she will accept a credit card. If you do not, you may find yourself on a ride to the closest ATM where the driver will stop and wait for you to get cash. Most Montreal taxi drivers accept US currency at par, as long as the value of the Canadian dollar is close to parity with the US dollar. Driving (SAAQ ) in Montreal can be a challenge for many North American motorists. Although turning right on a red light is allowed across the rest of Quebec (except at intersections where a sign indicates this is not permitted), right turns on red are strictly prohibited on the island of Montreal. The stop lights at most of downtown intersections are located on the opposite side of the intersection, not at the actual stop line as in some of Europe. There are also many private and public parking lots, and their prices vary widely. There may even be $15-$20 differences between two parking lots just a few blocks from each other. Street parking can be difficult to find on the weekends, and garages are often full. A few downtown hotels offer overnight parking for $12-15 a night. When it comes to parking, plan ahead. Many downtown streets are one way, which can complicate getting around. If you see a sign at an intersection that has direction arrows in a green circle, that means those are the only directions you are allowed to turn. Left turns are allowed on a green light provided there are no other signs prohibiting. Visitors should be familiar with the flashing green light , which indicates a protected left-turn (priority), which is equivalent to a green arrow in other parts of the world. Some signals are green arrows that flash, this is the same meaning. Autoroutes (expressways or freeways) can be challenging for visitors, as most signs are French, but most symbols are the same as in English Canada and the United States. For people who need a car for a short term, Montreal has many services to offer among auto sharing or car rental. If you are looking for a car-sharing company, Communauto is the most popular one. Amigo Express is also one of these companies, they offer an online platform which allows you to find a lift anywhere in Quebec. If you need a car for a roadtrip or another specific need, Hertz, Avis, Budget many big companies have branches in Montreal., but sometimes there is an advantage to choose a smaller company like Légaré, which gives you a free GPS in every rental. Pay attention - if you need to park in Montreal, it is not that easy to find the right place and the right moment. You will also probably have to pay for your parking. Please obey the traffic rules. Cycling is a very good way to visit the City, especially its central neighbourhoods like the Plateau Mont-Royal. The city has over 660km of cycle paths, which include recreational paths, on-street separated bike lanes, and on-street bike lanes labelled with painted lines but no barriers. Popular bike routes include the Lachine Canal path that stretches from Lachine, along Lac St-Louis, down to Old Montreal along the canal. You can cross over to the South Shore either on the Jacques Cartier Bridge, Île Notre-Dame, or via the Estacade ice bridge from Île des Sœurs. See "Do" for suggested bike path routes. Cyclists should be cautious when biking on shared routes with cars. Most drivers are courteous, but accidents are not infrequent. Drivers may not check for bicycles when turning, changing lanes, or opening car doors. Montreal drivers are also notably aggressive compared to those in rural areas or other cities in Canada. Street cycling is generally safe for those comfortable riding a bike in a flow of urban traffic, but those used to rural traffic or recreational cycling should stick to bicycle-only pathways. It is common practice for cyclists to ride slowly through red lights or stop sign, although these practices are illegal and police do occasional give out tickets. Lights and reflectors are legally required after dark and police do occasionally ticket for improper lights occasionally. Helmets are not required by law. Bike rental shops are common throughout the city, particularly in the Old Port and the Plateau areas. Bikes can also be rented through the public http://montreal.bixi.com/home/home-bixi Bixi system]. First, find a bike at one of the city's 460 Bixi stations. (Maps are available on the Bixi website or through the Bixi app.) Then, insert a credit card. You will be charged a $100 deposit that will be refunded after the bike is returned, and a service fee depending on your choice of usage. Choices include a single trip (30 minutes to take a bike, ride it, and return it to another station) for $2.95, a 24 hour pass (unlimited 30 minute trips over a 24 hour period) for $5, or $14 (unlimited 30 minute trips over a 72 hour period). Longer subscriptions are available as well. Stations are easy to find downtown and in central neighbourhoods, and also extend less frequently into more distant areas. Bixis are not designed for longer excurions like going on an afternoon picnic or taking a day trip. Extra fees accumulate after the 30 minute mark on any given trip, and they add up quickly. The sounds produced by electrical equipment when a Montreal Metro train is departing are actually the first three notes of Fanfare for the Common Man by Aaron Copland, although this is really just a coincidence. Montreal is home to one of the three public subway/metro systems in Canada, the others found in Vancouver and Toronto. The public transit system, run by Société de transport de Montréal (STM) , is safe, efficient, and is overall pleasant to use. Tickets have been replaced by cards with magnetic stripe containing one trip, called an à la carte ticket. These are valid for one trip (including unlimited transfers in the same way for 120 min) on the metro and buses, costing $3.25 each (exact fare in coins is required on the buses but not on the metro) but are also available for less when you purchase 2 for $6.00 either from the metro agent, the automatic fare vending machine located in metro stations, or an authorized seller. Unlike some subway systems you do not need the fare card to exit, but you can use the card to transfer to a bus, and you can be asked at any time by a transit cop to produce the valid fare card. So don't throw it away while you're still in the transit system or you can be fined. Note that Montreal metro stations and train cars lack air conditioning, the Metro can sometimes get uncomfortably hot, in every season. It does however still exist as the best transport option in the city. The train cars are all old (original rolling stock) and will be replaced over several years starting in 2016. Announcements are in French only as is the vast majority of signage. In addition, Montreal transit workers are not obliged to speak in any language other than French (with the exception of customer service representatives). While most transit workers are happy to speak to you in English and are generally friendly to visitors, it is possible that a question in English might be met with sign language or dead silence. It never hurts to begin a conversation with "Bonjour, est-ce que vous parlez anglais?" (Bahn-zhoor, eske voo pah-lay ahnglay? - see French phrasebook). The customer service counter at Berri-Uqam (on the Orange, Yellow, and Green lines) have English-speaking staff. In addition, airport staff are fully bilingual. When departing from metro stations in Laval and Longueuil, tickets and passes bought in Montreal can't be used. You have to pay a different fare inbound from those stations. If you are using cash to pay your fare on the bus, it is important to have the exact fare since the driver does not give change; you will receive an à la carte ticket, which is your proof of payment and your transfer. Passes are available which offer unlimited travel on the bus and metro for periods of 24-hours ($10) or three days ($18) and are well worth it to avoid fumbling for change, checking transfer times and restrictions, and worrying about getting off at the wrong stop and having to repay. There are also evening passes valid from 6:00 PM to 5:00 AM ($5) and weekend passes valid from 6:00 PM Friday to 5:00 AM Monday ($13). As with all fares, they are available everywhere there is an OPUS machine. Weekly ($24.50, week is from Monday to Sunday) and monthly ($82) passes as well as 10-trip fares ($25.50) are also available; unlike one-day and three-day passes, these fares must be loaded onto an OPUS card (see below) and are not available in paper ticket form. Only students (25 years and under) studying at a recognized academic institution in Montréal or seniors (65 and over) may benefit from reduced fares, and a special OPUS card must be obtained from the STM. The OPUS card is a smart card with a chip that contains your fare and transfer information. The OPUS card can be purchased at all metro stations for $6. Montreal has a commuter train system run by the Agence métropolitaine de transport (AMT)  with termini at the Montreal Central Station (Gare Central) and at Lucien-L'Allier (both are accessible from the metro). Commuter trains are handy for getting to suburbs and neighbouring towns. Commuter train stations are divided into eight zones that radiate out from downtown. Stations have automated machines from which you must purchase a ticket appropriate to the zones of the station you are traveling to or from, whichever is farther (for example, a trip from Zone 4 to Zone 3 or vice versa would require a Zone 4 ticket). In addition to the zone number, there are two types of fares: TRAIN fares (valid on commuter trains only) and TRAM fares (also valid on buses and the metro within the zone purchased). A prepurchased ticket card (SOLO) must be validated at the card scanners at the entrance to the platform. You can also purchase a six-trip ticket. As with the bus and metro, monthly passes require an OPUS card and reduced fares for students and seniors require a special OPUS card. 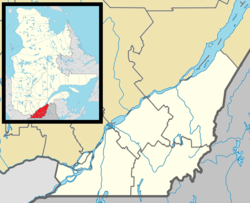 The official language of the province of Quebec is French. Although Montreal has a long history of being a bilingual English and French city, French continues to be the primary language of the city. There is a sizeable community of Anglophones (English as their mother tongue) and Allophones (a language other than English or French as their mother tongue). For this reason, 53.4% of the population is bilingual in English and French. In recent years, many of the immigrants who settle in Montreal already come from French-speaking countries, so you will notice many of the diverse ethnic groups speaking in French. Road signs, billboards, and metro announcements are only in French. However, services can be provided in both English in French in many restaurants, hotels, museums, taxis, etc. As French is the official language of business, you will usually be greeted in French. So even if you don't speak French, it's a good idea to know basic French phrases such as "bonjour", "merci", and "bonne journée" as a sign of politeness. In neighbourhoods that have many anglophones and/or tourists, you are more likely to encounter English spoken. In these neighbourhoods, even if all of the signs are written in French, you may be surprised to hear that most people are speaking in English. All signs must be in French due to language laws. If you are caught in a situation where you cannot communicate in French, it's often easy to find someone who is bilingual. Just ask "est-ce que vous parlez anglais?". The French in Quebec is not a different language - it is still standard French. However, it has its own unique pronunciation, expressions, and vocabulary dating largely from 17th century France. This may make listening a challenge to those who are not accustomed to it. It is not by any means a "fake French", and be warned not to call it this as it is quite insulting to Quebecers. Quebec French is simply an older French. Old Montréal contains the vast majority of historical buildings, most dating from the 17th - 19th century, and many museums. At night several of the buildings are beautifully lit up. A Tourist Office brochure lays out a walking map. Consider following it once during the day, and again at night. There is also a 45 meter clock tower located in the Quai de l'Horloge, originally called the Victoria Pier, which you can climb up and get breathtaking views of the St. Laurence river and to a lesser extent, the city. A few kilometres Metro ride to the north, Hochelaga-Maisonneuve offers the Olympic Stadium, Insectarium, Jardin Botanique, and Biodôme. Allow four hours to see all four. Montreal is renowned for its beautiful street art. Wander along Saint Laurent Boulevard between Sherbrooke and Laurier metros to catch glimpses of some of these impressive murals. You can also use Graffmap on your smartphone to help discover murals beyond Saint Laurent Boulevard while at the same time exploring new areas of the city. Another recommended area for mural spotting is St. Denis street between Sherbrook and Laurier, as well as areas in Park Extension and the Mile end. La Ronde, (member of the Six Flags family) 22, chemin Macdonald (metro Jean-Drapeau). $33.99, $25.99 without rides, 11- pay $20.99; Season pass for individual $85 or family $199. Discounts are readily available: A Coca-Cola tin is worth a $5 discount on any rides ticket. Parc du Mont-Royal  — Ski rental available and usually the best ski conditions. The greater Montreal area offers a number of large parks for year-round outdoor recreation. The most accessible are Parc du Mont Royal and Parc Lafontaine in the Plateau, Parc Jean-Drapeau offers the closest beach park, and Parc Maisonneuve, next to the Olympic Sports complex and Botanical Gardens. Further afield, Parc des Rapids and Parc Angrignon are in Le Sud-Ouest and Parc Rene-Levesque further West, with miles of bike paths and access to river surfing. River surfing — Although the Saint Lawrence River is frozen nearly solid for four to five months out of the year, the waterway has become a magnet for aficionados of this new sport. Unlike their oceanic brethren, river surfers ride the standing waves in fresh waterways. The Saint Lawrence has two main hot spots for the sport: Habitat 67 is close to the bridge between Montreal and Ile des soeurs, the site of the 1967 expo and the Montreal Casino. (This wave is also know as Expo 67). The Surf 66 Boardshop at the 1952 rue Cabot offers lessons. Parc Maisonneuve and Jardin Botanique de Montreal,  from rue Sherbrooke to boulevard Rosemont and from boulevard Pie-IX to avenue Viau (metro Pie-IX or Viau). The Jardin Botanique is one of the largest botanical gardens in the world and features the First Nations Garden, the Insectarium, and the Tree House, as well as 16 different themed gardens and greenhouses. Parc Jeanne-Mance, bordered by avenue du Parc, avenue Duluth (with a small extention south as far as avenue des Pins), rue de l'Esplanade and avenue Mont-Royal, directly across from Parc du Mont-Royal. Includes tennis courts, baseball/softball diamonds, a soccer/football pitch, beach volleyball courts, a skating rink in winter. Also a very popular dog-walking venue. Parc de l'Ile-de-la-Visitation, rue d'Iberville and boulevard Gouin, (514) 280-6733 (metro Henri-Bourassa, Bus 69 east). This regional park is along the Riviere-des-Prairies. Quiet and enjoyable place to bring a lunch and relax for an afternoon. Good starting point for a cycling tour along the river. Just For Laughs Festival — Comedy festival with three main components: indoor paid shows (usually stand-up, but not always), free street theatre/comedy, and a mini film festival called Comedia. July. Festival du Monde Arabe — In November, an annual festival celebrating the music and culture of the Arab world takes place in Montreal. Many Arab performers, traditional and modern, take the stage. Festival Mondiale de la bière — Annually, in early June: Five days of tasting beers, ciders, and other beverages from all over Quebec, Canada and further afield. 2004's event boasted over 340 different beers from 130 countries. There is no admission fee (but you can buy a souvenir sampling mug for about $8) and samples typically sell for three to four tickets ($1 a ticket) for a 150-200 ml sample. There are also scheduled musical performances and food kiosks. The festival can get very busy at peak times (Friday and Saturday evening of the event), so it is advisable to arrive early to avoid possible long queues. Montréal en lumière — A relatively new wintertime affair, attempting to transplant the city's festival magic to the cold season. Includes three main categories of activities: food and wine, performing arts, and free activities both indoor and outdoor. February. Montreal International Fireworks Competition, in La Ronde amusement park (in Parc Jean-Drapeau), 514-397-2000, [email protected] . This fantastic festival features full-length fireworks displays, accompanied by orchestral music, by national teams from about a dozen countries around the world. Although the hot seats are inside the La Ronde theme park, the fireworks are visible from pretty much any clear space or rooftop in the centre of the city. Pedestrians can watch from Jacques Cartier Bridge, which is closed from 8PM on fireworks nights. Another good spot is the promenade west of the Old Port. $35-45 (seats in La Ronde, free everywhere else). Saturdays 10PM from mid-June to late July, plus Wednesdays 10PM from mid-July on. Fete de St-Jean-Baptiste — June 24th is Quebec's national holiday (Fête nationale). During the evening, a huge show takes place at Maisonneuve park. This is the show to go to hear Made-in-Quebec music. Free. Street parties can also be found all over the city. MURAL festival — Started in 2013, this festival features many local and international street artists painting gigantic murals that will redefine Main Street (Saint-Laurent Boulevard) for the year to come. Along with live mural painting, MURAL features over 2 km of open-air market on Saint-Laurent Boulevard which closes to traffic for the occasion. Explore the murals for yourself. June. International Festival of Film on Art - organization devoted to the promotion and presentation of the finest productions on art and media art. A ten-day competitive festival, it is the most important annual event of its kind in the world. FIFA has become a focal point for artis and artisans from the art and film communities, as well as for art and cinema enthusiast. Montreal International Jazz Festival — The world's largest jazz festival, this festival is a major international event, attracting many big name artists. Many streets in downtown Montreal are closed off to traffic for two weeks and several concert stages are set up. There are numerous free outdoor shows and indoor concerts (paid). Late June - early July. POP Montréal International Music Festival 514-842-1919  — A massive feast of up-and-coming bands in a variety of popular genres. In early fall, host to more than 80 events, 300+ artists, a conference, an arts fair, and more! POP Montreal showcases emerging and innovative artists alongside rising international stars and is committed to encouraging vibrant indie communities. Francofolies — A festival celebrating French music. Similarly to the jazz festival, many free outdoor concerts are offered in a section of downtown that is closed off to traffic for a week. June. MUTEK — An annual gathering, held in Montreal, during the first week of June. The MUTEK festival showcases emerging forms of electronic music and the latest trends in sound creation. Heavy MTL — A two-day heavy music festival taking place in Parc Jean-Drapeau on Île Sainte-Hélène. The 2014 edition will take place August 8-10. Osheaga Music and Arts Festival — A three-day indie & alternative rock festival held annually in Parc Jean-Drapeau on Île Sainte-Hélène. The 2014 edition is scheduled for August 1st through August 3rd. Kinetik Industrial Music Festival  — A Nonprofit organization founded by a partnership between KAO Production & [i] Prod to promote the North American Electro-Industrial-Noize scene holds this festival, which usually takes place from May 17 to 20. Igloofest  — A electronic music festival held at the Old Port over several weekends in late January and February each year, billed as the coldest music festival in world. World Film Festival — The Festival is open to all cinema trends. The eclectic aspect of its programming makes the Festival exciting for the growing number of participants from the five continents. Every year, films from more than 70 countries, including well-known and first-time filmmakers alike, are selected. There are usually free outdoor projections every night. Late August to early September. Fantasia (Asian and fantasy) , July. Image + Nation (gay and lesbian) , September. Festival du nouveau cinéma de Montréal (new filmmakers, well-known auteurs, new media) , October. Cinémania (French cinema with English subtitles) , November. Les Rencontres internationales du documentaire de Montréal (documentaries) , November. Les Rendez-vous du cinéma québécois (Quebec cinema) , February. Canadiens, Ice hockey, Canada's national winter sport: Bell Centre (Centre Bell), 1260 rue De La Gauchetière (metro Lucien-L'Allier or Bonaventure), . One of the greatest institutions in Quebec culture. If you want to see a game, it helps to know someone with tickets, as they generally sell out within minutes of going on sale. They are widely available through unofficial channels and scalpers, but be prepared to shell out as they don't come cheap! Alouettes, Football (Canadian Football League), Percival Molson Stadium (Stade Percival-Molson), avenue des Pins at University (playoffs: Olympic Stadium), . A dominant team in recent regular seasons, the Als have won the Grey Cup three times since being reborn in 1996, including back-to-back in 2009 and 2010. Molson Stadium is an excellent place to see a game, but tickets can be hard to come by. The team has sold out every game in the facility since moving there in 1998. Impact, Association football (soccer), Saputo Stadium (Stade Saputo) located at 4750 Sherbrooke street East and Viau in the Olympic Park (metro Viau), . One of the newest teams in Major League Soccer, and the league's third team in Canada, joined MLS in 2012. The previous version of the Impact was a consistent contender in several different leagues (including three in the last three seasons before the team joined MLS) at the U.S./Canada second level. Stade Saputo reopened in June 2012 after a major expansion project; the Impact will also use nearby Olympic Stadium for occasional home games. Tennis — Montreal hosts an ATP World Tour Masters 1000 event (men) every odd-numbered year. In even-numbered years, Montreal hosts a WTA event (women),. Formula 1 Grand Prix — Circuit Gilles Villeneuve hosts a race of so called 'pinnacle of the motorsport' almost every year. The best drivers of the world compete during a three-day event which gathers about 100,000 spectators and is considered one on of the classics of this discipline, . NASCAR Nationwide Series — Circuit Gilles Villeneuve also hosts an annual race, currently known as the NAPA Auto Parts 200, in NASCAR's second-level Nationwide Series every August. 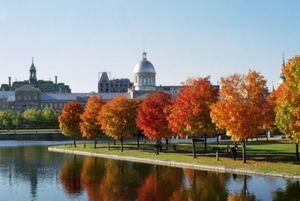 Montreal is a popular destination for language-immersion programs in French and English. Many schools arrange accommodations — either in dorms or with a family and provide cultural programs with trips around the city and beyond. Prices are usually higher for non-Quebecois and higher-still for non-Canadians. Most are located in Downtown and the Old City. Intensive, non-resident programs are also offered by the YMCA and Quebec government. Montreal is home to one of Canada's oldest and most prestigious universities, McGill University. McGill is consistenly ranked as one of the top 20 universities in the world. Concordia University is the city's other English-language university, and has over 40,000 students. The school's origins in and continuing emphasis on adult education make it popular for mature students, since it holds many graduate-level courses at night. Both universities are research focused. Université Laval and Université de Sherbrooke also have campuses in the Montreal area. Every university, with the exception of Laval, lends its name to a subway stop to indicate the university's approximate location. For example, the Guy-Concordia subway station, located at the intersection of Rue Guy and boulevard de la Maisonneuve ouest, is no more than two minutes away from its namesake university (Concordia). The North American Free Trade Agreement (NAFTA) allows skilled U.S. and Mexican professionals to obtain Canadian work visa provided they are qualified in certain professions. The American Consular Services website  provides an up-to-date list of qualifying professions. If you are an U.S. Citizen aged 18-30 and a full-time student, you can obtain a Canadian work visa valid for six months through BUNAC . Students from France, Britain, New Zealand, and Australia can also benefit from BUNAC work programs. As well, if you obtain a degree from a Canadian university, you are eligible to remain in Montreal and work for up to one year. For anyone else, the Immigration Canada (CIC) website  explains a number of ways foreigners can legally work in Canada. Maple syrup in Old Montreal. Montreal is a culinary mecca and has a huge variety of food options, from diners and fast food to low-cost ethnic restaurants to haute cuisine. The city was recently ranked 2nd best dining city in North America after San Francisco and ahead of New York. The large local Jewish population has contributed local specialties including huge smoked meat sandwiches (beef brisket) (Schwartz's is undisputably the most authentic smoked meat restaurant) and small, crusty bagels (the undisputed classic bagel places are St-Viateur's and Fairmount Bagels). Other specialties are "all-dressed" pizza (pepperoni, mushrooms and green peppers), pizza and spaghetti with smoked meat, and Quebecois favorites like split pea soup and poutine. Old Montreal beckons with many an authentic French themed cafe and old world French themed restaurants that specialize in both imported wines and provincial cuisines. To buy your own food or regional products, the public market at Jean-Talon, 7075 avenue Casgrain (metro Jean-Talon or De Castelnau), is the place to go. Open daily from 8 a.m. to 6 p.m, the market is especially noteworthy for its selection of produce. Even though they're not strictly part of the market, the many stores lining it on the north and south sides complete it wonderfully with superb selections of cheese, meat, and just about anything edible. The surrounding streets are heavily Italian-flavored and feature a number of excellent grocery stores, butchers, bakeries, and restaurants. With delis and bakeries and diners galore, Montreal offers great budget dining. Venues are scattered all over the city, but the largest concentration of restaurants is along boul Saint-Laurent, rue Saint-Denis, ave du Mont-Royal in the Plateau. Tasty and cheap ethnic food, lots of Indian buffets, can be found around the Jean-Talon market. Notre-Dame street in the South-West (Sud-Ouest) borough also features a wide selection of restaurants. Two Montreal classics, poutine and the smoked meat sandwich, can make a filling meal for under $10. Pizza-by-the-slice can be had for a toonie (2$), and there's always the option of rolling your own picnic with fresh produce from Marché Atwater or Jean Talon Market. The legal age to purchase alcohol in Québec is 18 and the Quebecois are now much more rigid in enforcing this age limit. All retail alcohol sales stop at 11 p.m. and bars and clubs stop serving at 3 a.m.
Quality wine and liquor (but only a small selection of imported beers) can only be purchased at SAQ shops, most of which are open until 6p.m. Sunday to Wednesdays and 8 p.m. or 9 p.m. on other days; the smaller SAQ Express outlets are open daily from 11AM to 10PM. Beer and a small selection of lower-quality wine are also sold at convenience stores (dépanneurs) and grocery stores. Some supermarkets have partnered with the SAQ to offer a few selection bottles, so if you are caught outside business hours or are in a hurry, places like IGA Extra and MÉTRO generally offer a better variety of wine than the local dépanneur. The selection of beer to be found in grocery stores and even the humble corner store have exploded in the last decade in and around greater Montreal. Two micro-breweries in particular are world-class: McAuslan (brands include St-Ambroise and Griffon) and Unibroue (Belgian-style ales such as Blanche de Chambly, Maudite, La Fin du Monde, as well as simpler, more affordable U lagers). Boréale makes a good, if unspectacular range of brews, while Rickard's and Alexander Keith's domestics are gaining popularity among locals. Most stores also sell a few major imports such as Stella Artois, Sapporo, Guinness, Leffe and of course, Heineken. Montreal has three main strips for bar-hopping. Rue Crescent, in the western part of downtown, caters mostly to Anglophones and tourists. It tends to be trendy and expensive. On the edge of the bar-heavy Plateau, Boulevard Saint-Laurent gets extremely busy when McGill and Concordia students are back in town for a new session. Between rue Sherbrooke and avenue des Pins you'll find trendy clubs and bars with more of a Francophone clientele. Farther up St-Laurent, it's relatively downscale and linguistically mixed. Rue Saint-Denis, between rue Sherbrooke and de Maisonneuve, is the strip with the strongest Francophone feel. There are also many good bars away from the main strips. You should never have to line up to go have a drink, because there's virtually an unlimited choice. Depending on the day of the week, the best events vary. For example, on Tuesday you should go to Les Foufounes Électriques for cheap beer and an unique experience. Time Supper Club, 997 rue St Jacques The first Supper Club in the city, Time Supper Club starts as a restaurant and slowly turns into a night club. Trash Bar, 3699 Boulevard Saint-Laurent. Skate, punk night clun on two floors. Tokyo Bar, 3709 St-Laurent. Dress to impress. Offers various rooms with comfortable couches and an outdoor terrasse. Plays a mix of club music/retro/hip hop that will keep you dancing all night long. After-hours clubs, for those who aren't tired out by 3 a.m., are open a.m.-10a.m.. Note that they do not, by law, serve alcohol at this time. Montreal has as many gay and lesbian bars as San Francisco and every October on Canadian Thanksgiving (Columbus Day in the U.S.) hosts the "Black and Blue" circuit party, attracting thousands to enjoy the thrill of harder dance music and hordes of pretty, shirtless men. Most popular gay bars can be found in the city's Gay Village, located on the eastern stretch of Ste-Catherine and easily accessible by the Beaudry metro, between Amherst and Papineau. Bar Renard, Unity, and Sky are the club favourites, while Cabaret Mado offers excellent drag performances. There are many popular gay club events that happen every month too such as MPUat the Belmont and LuvHausat Blockhaus in the Hochelaga neighbourhood. There are also numerous pubs such as Stud and Black Eagle, male strippers, restaurants, saunas, and karaoke in the area. The four main strippers bars are Stock, Campus, Taboo, and Adonis. The most popular sauna is Oasis. A good place to start any search is with this gay owned and operated link  for Montreal, Quebec, Canada with gay travel info in easy-to-use listings as a directory. For the budget traveler, Montreal offers youth hostels with dorms or private rooms as well as budget bed and breakfasts (sometimes with very skimpy breakfasts). The densest collection of budget hotels are in the Latin Quarter, in the streets east of Berri-UQAM metro and the long distance bus station. Old Montreal has a couple of quality hostels, but you'll pay more to be there. Montreal is also the city with the most Couch Surfing members, so it is easy to find a hospitable local host for a few nights. Mid-range options include Downtown chain hotels to "gîtes", guest houses that range from a single room in an apartment to elegant historic homes with three to five rooms. Gîtes are usually found in the more residential neighbourhoods like the Plateau. On the upper-end, four and five-star luxury and boutique hotels are mostly concentrated in Old Montreal and Downtown. Montreal is home to four major universities and numerous smaller schools. Students routinely sublet apartments in the summer months. Montreal has four area codes: the long-standing 514, the newer 438, and 450 as well as now 579 for surrounding, off-island areas. The area code must be used for all calls: even if it's the same one you're calling from and even if calling next door. For example, calling a 514 number from within 514, use "514-123-4567". Dialing the same number from outside 514 area would be 1-514-123-4567. There are also long-standing cyber/internet cafés (minus the café part) such as Battelnet 24 at many locations in Montreal including one at mezzanine level in the rue Guy entrance of Guy-Concordia metro. Of course, free internet access is the best kind of internet. The organization Île Sans Fil  provides free wireless internet in cafes and other locations throughout the city. Look for the sticker outside participating venues. The Eaton Centre downtown offers free wireless access in the food court. In addition many coffee shops in Montreal such as Tim Horton's, Second Cup, and Starbucks offer free Wi-Fi for their customers. Also, the Grande Bibliothèque (Great Library) has many freeinternet terminals: you can get a library card (free to Quebec residents with proof of address) to use it there. Although Montreal is Canada's second largest city, it shares Canada's low violent crime rates making it relatively safe. However, property crimes, including car theft, are remarkably high, despite appearances to the contrary: make sure to lock your doors and keep your valuables with you. Take extra care if you want to visit Montréal-Nord or Saint-Michel. These neighbourhoods can be dangerous and shootings are not unheard of in these areas. There is, however, little for tourists to do and they are unlikely to enter there by accident. That being said, most tourists are surprised at how safe Montréal feels in comparison with other North American cities. In many neighbourhoods, children play in the streets unsupervised by parents, doors and windows are left open during the summer (perhaps unwisely), bicycles are secured with flimsy locks and left outside overnight (not recommended), and people seem to be determined to preserve the city's relaxed atmosphere. Part of Montreal's Sainte-Catherine downtown corridor is arguably the grittiest part of the city, especially east of Place des Arts. There are homeless people panhandling during the summer and fall. Although most of them are polite, there are some that are more aggressive. Avoid individuals wandering on the streets that appear intoxicated. The street is at its most dangerous around 3:00 a.m. when closing clubs and bars empty their drunk crowds into the street. You may also come across occasional pockets of street prostitution, especially around strip clubs. If you are concerned about safety on the metro, use the first metro car where the driver is. Emergency intercoms are on every metro car. Emergency phone booths are on every platform throughout the metro system, which is generally safe. While written instructions are in both English and French, most announcements (usually about delays) are in French only so if you think you heard something in the announcement that may affect you, just try asking a fellow passenger for a translation. "Panne de service" means "interruption of service" and "ralentissement" means "slowdown, while "le service est réétabli" means "service is restored." These phrases are followed by name of the métro line, i.e. "Le service est réétabli sur la ligne orange" means "Service on the Orange Line has been restored." As well the STM, Société de transport de Montréal offers a "between stops" (entre deux arrêts) service that allows women travelling alone at night to get off the bus between two regularly designated stops when/if the bus driver feels they can stop the bus safely. In the winter months homeless and transients tend to gather in the various metro stop stations. Proceed with caution and don't travel alone late at night into these zones. The entrance to Square Victoria on Beaver Hall is one such place. Montreal is often icy and cold in winter, be careful by dressing appropriately for the conditions and be mindful of ice or snow anytime you are driving or walking. It is not unheard of for tourists to get frostbite for walking several blocks on a sunny but cold day of -35 °C or colder without suitable clothing. Long underwear is strongly recommended to avoid frostbite and circulation problems. Street clearing of snow is generally effective but watch out for ever present black ice! Summers are quite hot and can be very humid. Being surrounded by rivers adds to this effect. Keep hydrated. At the above hospitals, you will have no trouble getting care in English. At others hospitals, there may be some difficulties. If you do not have Quebec Health Insurance, be prepared to pay by credit card at the door as it does not accept traveller's insurance (but you will be reimbursed when you return home). The Embassies & High Commissions for almost all countries are located in Ottawa, 200km to the west of Montreal. The website GoAbroad.com  has a mostly comprehensive list of all consulates in Canada listed by country indicating which cities have a consulate. The consulate's contact information, address, phone, fax e-mail and web page, is included. The Gazette is the city's English-language daily. Canadian national dailies The Globe and Mail and The National Post are also widely available. If you have some French, hit the "voir.ca" website for good resto reviews and an overview of what is happening. Also, the main newspapers in French here are the Journal de Montréal, La Presse and Le Devoir. As in the rest of Quebec, language politics and Quebec sovereignty are contentious issues in Montreal. Don't make the assumption that all Quebecers are in favor of Quebec's separation from Canada as many are against it. If you really want to discuss those topics with locals, be sure you are well-informed. It is still safer to avoid the subject, as it is still a very emotional issue. Use common sense and be respectful. The first language in all of Quebec is French. Making an attempt to use the language is a great way to show respect for locals, whether or not they can speak English, even if you can manage only a few words with a very strong accent. However, it should be noted that Montreal is considered to be one of the world's most bilingual cities with a significant minority of residents whose primary language is English. In case of doubt, you may want to open with a warm "Bonjour!" (Good day) and see what language is used in response. Most likely you will be answered in English, if your French accent does not sound local. Try not to be offended if you are trying to speak French and locals respond to you in English. Since most Montrealers speak both French and English, with ease, they are simply trying to make things easier for you. Many people in the city and especially those working in the tourist and service industries are completely bilingual speaking either language without any accent making the city very cosmopolitan. Don't make jokes about French people (especially since francophones in Montreal are mostly Québécois with a few Acadiens and Franco-Ontariens, all of whom consider themselves different from the French from France and from one another and it's just plain uncivilized!). Also, do not assume that all Québécois are francophones. Montreal has a significant English-speaking community with a long history in Quebec and many immigrants whose first language is neither English nor French. See also Quebec#Talk, Quebec#Respect and the French phrasebook. Montreal makes an excellent entryway for visiting other cities and destinations in Quebec and northern United States. Remember that you will have to pass the border control if you go to the US, and arm yourself with the appropriate Visas and papers. Add at least one extra hour for the border control. Quebec City, about 3 hours to the north east on Highway 40, is almost but not quite a day trip. You'll want to stay over, anyway. Mont Tremblant lies less than two hours north in the Laurentides. The Eastern Townships are two to three hours straight east. Explore the Monteregie townships, a short drive east of Montreal. Ottawa is two hours west by car. Toronto is more distant, but still a doable six hour drive (or a faster 4.5-hour train trip). Adirondacks is a two and a half hour drive to the south. Adirondacks is the largest park in the contiguous United States and offers outdoor activities like hiking, rafting and skiing. Boston is a five hour drive to the southeast. The Chateau Montebello, located an hour and a half west in Montebello, makes for a romantic getaway or stop on the trip to Ottawa. Between December and March there is good downhill skiing in the Laurentians and in the Eastern Townships. There are some very good night-skiing centres such as Ski Bromont and Mont-St-Sauveur. New York City is only a six and a half hour drive directly south. This page was last edited on 22 April 2019, at 22:12.